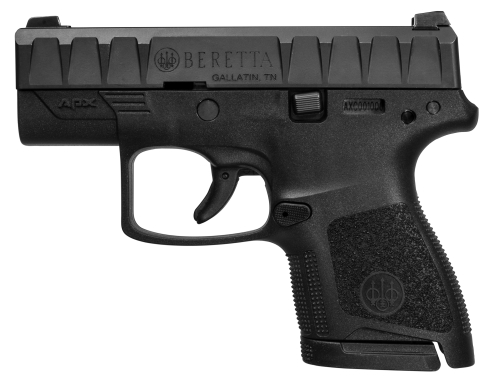 (Accokeek, MD) Beretta is excited to announce the launch of our brand-new pistol, the Beretta APX Carry. Specifically designed for concealed carry, the APX Carry pistol extends the proven Beretta APX series to now include a single stack, sub-compact profile offering. Intended for personal protection, the Beretta APX Carry features a low bore axis that produces less felt recoil and a natural point of aim as well as dramatically improves follow-up shot acquisition. With superior performance, this lightweight pistol utilizes a smooth DAO-style trigger that crisply breaks at 6.5 Ibs, which results in the shooter’s complete control of each round fired and an improved trigger feel. The Beretta APX Carry was developed to be easily concealed with its single stack, sub-compact and thin grip design that makes it essentially invisible, no matter the clothes you wear or whether you carry inside or outside the waistband. Ideal for home protection or for any defensive situation, the APX Carry features aggressive slide serrations, a textured grip frame, and a flat trigger guard that enable the user to ensure and maintain a firm, secure, and instinctive grip in all situations, making it the perfect concealed carry choice. Available in Flat Dark Earth, Wolf Grey, and OD Green frame colors, this versatile pistol can be customized for each individual with the selection of the perfect magazine for their concealment style: an extended 8-round magazine, a 6-round magazine with pinky extension, and a flush baseplate (included in the box). The APX Carry will debut at the upcoming NRA Annual Meetings and Exhibits in Indianapolis, IN from April 26-28 in the Beretta booth (#6255). The Beretta APX Carry is available at Beretta dealers and sporting goods stores and retails for an MSRP of $450. Customers can also learn more about the new APX Carry pistol by visiting APXcarry.com. Beretta, established in 1526, is the oldest industrial dynasty in the world tracing its roots through 15 generations of continuous family ownership. Firearms bearing the Beretta name have been sold for almost 500 years. Beretta USA Corp. was founded in 1977 and supplies the standard sidearm to the U.S. Armed Forces. Today, Beretta manufactures, distributes, and markets a complete line of firearms, accessories, and apparel. Beretta also owns and operates six retail Beretta Gallery stores worldwide. For additional information, visit www.Beretta.com.